Hana's Suitcase by Karen Levine. Audiobook from Brilliance Audio. 2009. Copy supplied by Brilliance. The Plot: Fumiko Ishioka, curator of the Tokyo Holocaust Education Center, receives a child's suitcase from Auschwitz to display at the center. A name: Hana Brady. A birthdate: May 16, 1931. Who was Hana? What happened to her? The horror of the Holocaust is told in the dual stories of Hana and Fumiko's efforts to find out who she was. Non-fiction. The Good: Hana's Suitcase is a child's nonfiction book that is full of pictures, illustrations, drawings; things that bring the story alive. How could a book that is so dependent on seeing what Hana looks like translate to audio? It does; two stories unwind, skipping back and forth between Hana's story and Fumiko's efforts to uncover the story of one child. An ordinary child, an ordinary life. Until War World II. Yes, this is good history; but it's also the story of being a history detective. We follow Fumiko step by step as she tries to uncover Hana's story, researching, looking into archives, sending letters. Hana's story is revealed to us so that we know a little more than Fumiko -- but so slowly that we don't know the answer to what happened to Hana until Fumiko finds out. There is nothing in the text that doesn't make sense; no reliance on photos or illustrations unseen. The Hana's Suitcase website has many photographs for the reader who wants to see what Hana, George, and their parents looked like. Oh. 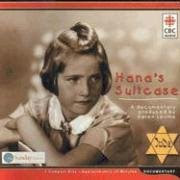 In looking to find out more about Hana and her family (especially the aunt and uncle) I found this CBC report on Life After Auschwitz. Which led me to discover that the suitcase is a replica. As Lara Hana Brady says, it's about the people, not the items. This will make the perfect birthday gift for my sister. I'm so glad I stumbled upon your blog (from Laurie Halse Anderson on Facebook). Thanks!